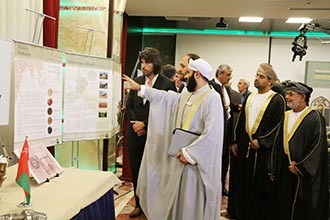 The exhibition “Oman's Message of Islam” has reached the Republic of Albania in collaboration with The Almasar Albanian Institution and in coordination with the religious affairs committee of the presidency of the republic. 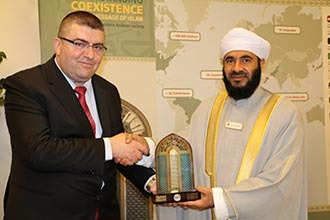 The opening ceremony was held in Albania's capital city, Tirana, at the Tirana International Hotel in the presence of a number of diplomats from Arab and foreign countries; the heads of universities and colleges; representatives of various religions and religious and cultural centers; journalists; and a large number of interested people. Oman's Ministry of Awqaf and Religious Affairs promotes the values of understanding, coexistence, and dialogue between people, and focuses on humanitarian customs, renouncing all forms of extremism, violence and hatred, and calling for respect for Prophet's holy books. The opening ceremony began with welcome words from Ilir Ho Julie, the chairman of the religions committee of the presidency of the Albanian Government. He said: "This exhibition is highlighting the heavenly message in all societies and we here in Albania have various religions living in peace, and tolerance. " He added: “We hope for more cooperation between the two sides in the future." Sheikh Mehdi Gora, the president of the Association also gave a speech, stating: "We thank the government and people for the opportunity to organize this exhibition, which highlights religious and cultural life in Oman." He also expressed his thanks to the Ministry of Awqaf and Religious Affairs for organizing the exhibition, which is held for the first time in Albania. He added: "commend this fruitful cooperation towards the common interest that benefits contemporary societies to raise the level of religious and cultural awareness in this region and in the whole world. Albania is a model tolerant country in the West and Oman is a model of tolerance in the Middle East," and he hoped that the exhibition succeeds in strengthening the bilateral relations between Albania and Oman. From the Omani side, Dr. Mohammed bin Said al-Mamari, general supervisor of the exhibition, spoke on behalf of the Ministry and expressed his great happiness to have Tirana host the exhibition, which expresses the atmosphere of friendship and brotherhood between the two countries. He mentioned humanitarian issues that combine the goodness, tranquility and peace in the world. He thanked all who have contributed to the success of the exhibition, especially the Office of the Presidency and the Foundation. In the exhibition, Mr. Salah bin Juma Al Shukairi gave a presentation on the beauty of calligraphy, and showed the audience his expertise and skill in calligraphy. 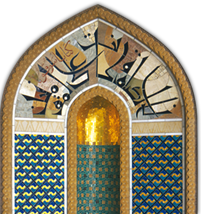 The artist Ramlah bint Salim Albulushi also offered a presentation about calligraphy. 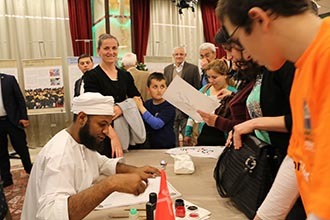 The audience also had the opportunity to have their names written in Arabic. They are the first Omani artists to give presentations in Albania. The campaign: «I do something for tolerance» (#Act For Tolerance ) was also launched during the opening in Albanian, a global information campaign which aimed to spread the culture of coexistence and peace; and tolerance and harmony, through the deployment of cards which reflect these values in social media and websites in different languages.